I'm using a slightly over-used citation now: "Good news everyone! ", but it fits just too well! 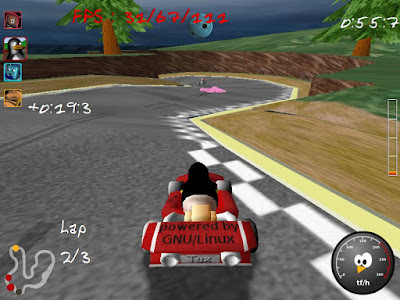 SuperTuxKart 0.7 alpha will soon be released. We have no date, as always, but it should be really close; just a few days away hopefully. New drivelines and Track exporter. But, you might not be an artist and you still want to try the new version. Go ahead; we won't stop you. Furthermore, you can help out with translating SuperTuxKart; we're happy for every language we can get. Unfortunately, there are no support for 32-bit length characters used in many Asian languages. This is being worked on, but the alpha version will not include this feature. The regular font includes many special characters used in other languages, but the orange header font does not have many of those, as it's a custom created font. Please use this forum thread for special character requests; they will be added gradually when Auria get the time for it. If you want to give bug reports, you'll have to do it using the bug tracker. And before reporting any bug, check that it's not listed already in the bug tracker or in the ToDo. The alpha version will probably have quite some bugs, but many are known already and posting duplicates will just give the devs more to answer and less time focusing on getting them fixed. Also, please include as much details as possibly needed (OS, if it's reproducible etc). Now, the alpha is not released yet, but I'm writing this as a preparation. As you see I've skipped the usual "STK w/Irrlicht:" in the post title, since the STK w/ Irrlicht branch has been moved to trunk. There will be no possibility for confusions from now on. So, what has happened in trunk lately? Not much to look at, as translation and other matters are in focus at the time. But, one significant change has been made. We've got a changed version of 'The Lighthouse' track. Exciting, isn't it? Many thanks to Stephen Dunn. You'll also notice that the speedometer is now displayed properly, and while it's been in the SVN version for quite some time, I want to thank Yekcim for the new speedometer icon.